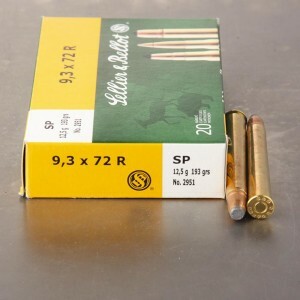 9.3 x 72R is an older European cartridge designed specifically for hunters. The 9.3 x 72mm rimmed round is quite large by both current rifle projectile standards and by case length, but the round is not exceptionally powerful. In fact, it was actually more or less considered a medium bore rifle when it was designed. The 9.3 x 72R topped with 193 grain projectile can reach upwards of 1,900 feet per second. You’ll most commonly find 9.3 x 72R ammo in three barreled hunting instruments known as drillings. A drilling is most commonly a combination gun featuring two shotgun barrels atop a rifle barrel. These weapons were used exclusively for hunting and were most commonly found in Europe. 9.3x72R ammunition is capable of taking most all game across Europe including bear, large deer, and hogs. When combined with a set of 16 gauge barrels the drilling was probably the most versatile hunting weapon of its day. Accurate and hard-hitting. Can't wait to try it out on some game. Used this in an old Saur & Sohne drilling. Functioned great and rang the 50 yd. gong every shot. For my 80 year old eyes and the small open sights on that drilling, that was great. Nice finding a cartridge my drilling likes right at the start. Hard to find ammo. Delivered quickly.